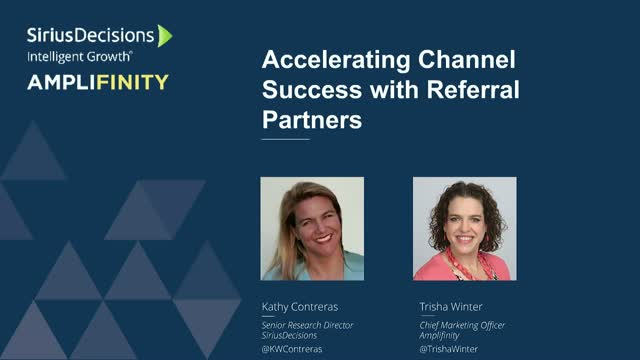 Kathy Contreras, SiriusDecisions Sr. Research Director for Channel Marketing Strategies, will share best practices to building a market-leading referral partner program. A new data report on the performance of B-to-B referral partner programs will be shared by Trisha Winter, CMO of Amplifinity. Together they will provide guidance on enabling referral partners to drive growth and the expected impact to your business. Untap high-value, low-cost growth with Amplifinity's referral automation software. Referrals are great in concept, but how do you build a consistent pipeline from them? Sales and marketing professionals will want to tune in to this roundtable interview with referral coaching and selling expert Mike Garrison, President of Garrison Sales Consulting and Larry Angeli, CRO for Amplifinity who uses referral selling with his sales team and advises clients on approach. >How do you identify good referral sources? >What is the value proposition for them to refer? >How should you approach and recruit them? >How can marketing help sales to do this? >How can you ensure a steady flow of referrals? Join Trisha Winter, CMO of Amplifinity, as she shares the data from the analysis of all referral partner programs run on the Amplifinity referral platform and what the data means for those that want to get more high quality leads from their partner network. Join Trisha Winter, CMO of Amplifinity, as she shares the data from the analysis of all customer referral programs run on the Amplifinity referral platform and what the data means for those that want to get more high quality leads from their customers. Lisa Nakano, SiriusDecisions Service Director for Customer Engagement Strategies, will share research and methodology behind the value that customers can bring to your company if engaged with strategically. A new data report on the performance of B-to-B customer referral programs will be shared by Trisha Winter, CMO of Amplifinity. Together they will prove with data the case for leveraging customers for demand generation and the results seen by companies that are running this as an always on channel. As presented at Dreamforce 2016: Referral marketing is becoming a standard part of the lead generation mix. For companies with sales teams, this means enabling sales to play a key role and that includes making it easy for them to obtain and track referrals in Salesforce. This session will showcase how 3 companies have successfully integrated referral programs into their sales teams and explains the integration with Salesforce that allows them to drive high quality leads at scale. With continuing pressure from sales to produce more high-quality leads, referral programs are being used by B2B marketers to meet demand. TSYS shares their experience in starting a referral program for their customers, employees and partners. They’ll share how they got started in referral marketing and how they changed their program design as referrals became an important part of their marketing mix. Smarketing. It’s the new buzz term for Sales and Marketing alignment that lots of people are talking about, but few are addressing tangible steps to get value from it. In this webinar we bring a software Marketing and Sales Executive together to outline key steps to increase the maturity and corresponding benefit from Smarketing. Referral programs can be a consistent channel for high quality lead generation, but only if marketing does their part to promote it. Cable One Business and Mosquito Squad join Amplifinity to discuss how they promote their referral programs and drive success. RaaS is the concept of “Referrals as a Service” as a way to develop and harness referral partners. The phrase was first coined by Randy Fahrbach, Sr. Mgr. of GoTo Channel Development at Citrix. Randy joins Amplifinity CEO, Larry Angeli, on this webcast to discuss why RaaS is working at Citrix and what other Channel Managers can learn from their experience. Referral programs generate a clear impact on top line revenue and provide leads that convert better and faster than traditional marketing leads. If you are thinking about starting a referral program there are many things to consider and you most likely have a few questions. Join Trisha Winter, CMO at Amplifinity to discuss how to start a referral program that will garner success and provide unparalleled ROI. If you are thinking about starting a referral program, you’ll need to consider how you plan to promote it. Referrals can be an always-on channel for demand generation if you understand the best ways to keep the channel producing. Join Trisha Winter, CMO, and Joel Van Haaften, VP of Client Services at Amplifinity as they discuss all of the ways that Amplifinity’s most successful customers promote their referral programs. There is incredible pressure on marketing to show ROI. At the same time, there are some amazing new technologies and initiatives we are being asked to tackle. How do today’s marketing leaders navigate this and obtain budget for these new projects? Join Trisha Winter, CMO of Amplifinity and a panel of executives to discuss how to get executive buy-in for new marketing projects. A referral program is a consistent channel for demand generation. Josh Beach, CTO of Amplifinity, walks through what marketers need to think about when planning to launch a referral program. You'll learn the key decision points in designing your program and best practices from the many customers Josh has helped to architect their referral success. Amplifinity’s referral marketing platform creates a new channel for demand generation and customer acquisition. Enterprise referral automation enables marketing and sales teams to leverage their brand advocates – customers, employees and partners – to refer people they know to your brand. Amplifinity integrates with your critical systems to allow for integrations, reward tracking & fulfillment. You know how to automate campaigns with the best of them. But with the rise in companies turning to referral marketing, are you prepared to execute on this new demand generation channel? Mark Brier, Director of Referral and Upsell Marketing, and Brian Chiosi, Marketing Systems Lead, will walk you through RingCentral’s journey to create and automate referrals to become a key revenue generator for their business. There is a lot of buzz about Advocacy, but should you care? Jonathan Murray, Draper Triangle Managing Director, provides a breakdown of the types of technologies that are being grouped under “Advocacy”. Brian Gladstein, EVP of Technology Marketing at GYK Antler discusses what both brand awareness and demand generation marketers should be considering within Advocacy and will provide an approach to help you figure out how to get started with advocacy technology. Customer advocacy is great when you can get it, but getting it is usually ad hoc. With new technology available, savvy customer marketers are realizing that there are ways to scale customer advocacy and harness it for demand generation. Bob Peterson, Research Director for Customer Advocacy at Sirius Decisions will discuss the drivers behind investment in customer advocacy and Trisha Winter, CMO of Amplifinity will share examples of how Customer Marketing can get started. With increasing pressure on marketing to drive growth, we strive to provide expertise for marketing and sales on how to establish an enterprise referral channel to grow revenue.